Name: Seishiro Niwa (say-shee-row nee-wah). Education: PhD (International Christian University, Tokyo, 2003). 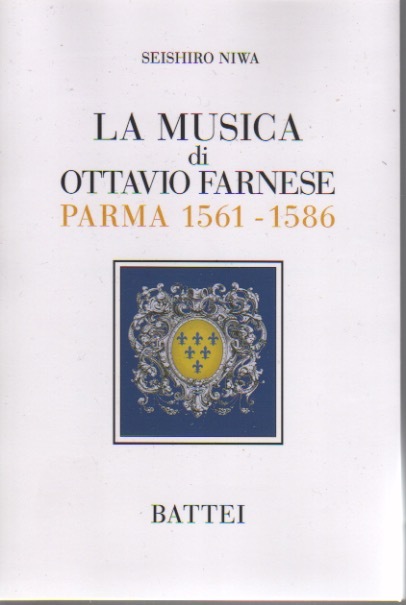 La musica di Ottavio Farnese, Parma 1561-1586 (Parma: Battei, 2015). For details of this book, please look at this PDF document. This book is not available at bookshops but only through this web site. If you are interested in it, please write to me directly (info [at] niwasse.com). I need the following information to send the copies properly. The price is 3500 yen plus the cost for sending. In a broad sense, patronage of music in 16th-century Italy. Ottavio Farnese’s patronage of music in Parma (1561-86). Association with music by other members of the Farnese family. In my college years, I learnt that Italian opera was created in Florence around 1600. I simply wondered who sang the first operas. They must have been wonderful musicians for two reasons. First, opera songs were (and still are) difficult to sing. They were capable of doing it. Second, they were pioneers of this brand-new theatrical art. It is always hard to cultivate new things. I read books and found some names of the first opera singers. I was not satisfied, however, because finding their names is just a beginning of the whole story. When we ask ‘who?’ in a historical sense, we need to know more than just names, especially their background, such as social status, education, and association with others. This was the beginning of my research into the socio-historical background of music, especially issues about the patronage system in early modern Europe. If you are interested in them, or have questions about them, please write to me. Ottavio Farnese’s chapel in Parma, 1561-1586. PhD dissertation. International Christian University, Tokyo, 2002. I studied archival documents in Parma and elsewhere and described overall image of Ottavio Farnese’s patronage of music in Parma. On the one hand, I feel pround that it was the first general survey of this field based on extensie arvhival documents. On the other hand, I find it necessary to re-write it because a lot of new information has been revealed since then. Download. I studied a series of newly found documents and described Margherita d’Austria’s patronage of music in Brussels and in Abruzzo. She held a self-contained court, separate from her husband Ottavio’s, in which she had a chapel. This was quite remarkable among contemporary women patrons. La musica alla corte parmense prima dell’arrivo di Claudio Merulo [Music at the Parmese couort before Claudio Meruolo’s arrival]. An article based on my oral presentation in Le arti del virtuosissimo Claudio: convegno internazionale di studi in occasione del quattrocentesimo anniversario della morte di Claudio Merulo (Parma and Correggio, November 2003). In practice, a brief summary of my PhD dissertation. Tōhō Gakuen Tankidaigaku kiyō 8 (2012). Published on-line. I studied Il famoso convito, a festival book about the carnival feast in Piacenza in 1561. I described its general background and analysed details of the events. I revealed that the event was not just for fun but carefully designed to achieve political effects, i.e. to confirm and to reinforce the ties between Ottavio Farnese and the local feudatories. Download. Philippe de Monte hoffte kirchliche Pfründen [Philippe de Monte wanted to have ecclesiastical benefices]. Tōhō Gakuen Tankidaigaku kiyō 9 (2013). I collected information about Alessandro Farnese’s involvement in music, both from archival documents and from published materials, and described his attitude towards music. He actively promoted music at his court in his yourth, but later put it as a secondary matter in his patronage strategy. He promoted music indirectly by supporting l’Arciconfraternità di SS. Crocifisso. A much expanded and re-written version of my PhD dissertation. I corrected some errors and added new information which I found after submitting it. I expect that this book will serve one of basic materials for the history of 16th-century Italian music.